Belongs to the family of Flaviviridae, the type of virus responsible for dengue fever, chikungunya and yellow fever. Transmitted to people through the bite of a virus infected Aedes mosquito. Infection often leads to mild symptoms (fever, rash, conjunctivitis and joint pain).similar to that of dengue fever. Can be transmitted from pregnant women to the fetus and cause microcephaly and severe brain deformities in the babies. Currently the only way to diagnose Zika virus with certainty is by testing the blood, saliva or urine of a sick person for the presence of the virus. Currently there is no vaccine for Zika virus. 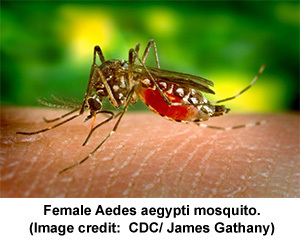 The best way to avoid the virus is to prevent mosquito bites by wearing long-sleeved shirts and pants, using mosquito screens and by applying insect repellents that are certified by the Environmental Protection Agency (EPA). 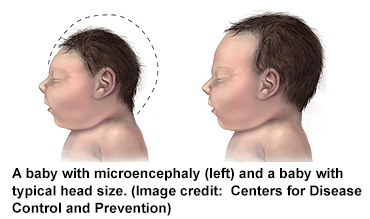 Microencephaly resulting from the Zika virus may be mild or severe. The clinical definition of microencephaly is that the head occipto-frontal circumference is more than two standard deviations below the mean for age and gender. Babies with microencephaly have smaller and less developed brains. An ultrasound test in the third trimester can sometimes identify the problem. Microencephaly may cause seizures, developmental delays, problems walking and with motor coordination and delays in hearing, vision and speech. There is no way to reverse the small size of the head. Therefore, these babies need close follow-up with their healthcare provider to monitor their growth and development. Speech, occupational and physical therapy also help. Neuronal development is a complicated process that requires generation, migration and differentiation of neurons. Microtubules, microscopic structures found in the cytoplasm of neurons, play a critical role in all the development of the nervous system. Tubulin, a protein that is an important component of microtubules, and mutations in certain subtypes of tubulin protein have been linked to various neurodevelopmental disorders. Scientists have reported that a depleted subtype of tubulin known as Tubb5 prevents the proper migration of neurons in mice. The scientists also looked at three patients with microencephaly and found mutations in Tubb5 in all of them. Therefore, it is likely that Tubb5 is an important factor in the development of microencephaly. It remains to be determined if Tubb5 is involved with microencephaly associated with Zika virus. 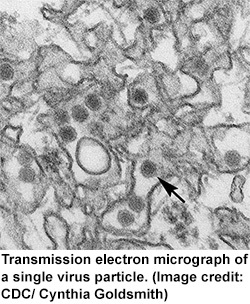 Zika virus has also been linked to Guillain-Barr syndrome. In contrast to microencephaly which affects the central nervous system, Guillain-Barr syndrome affects the peripheral nervous system. Specifically, the immune system mistakenly identifies peripheral nerves as intruders and damages the myelin insulation resulting in muscle weakness and changes in sensation and pain. In Guillain-Barr syndrome, white blood cells target and attack the Schwann cells, and hence the myelin coating on peripheral neurons.